Check out a gallery of the Black Caps winning the 2nd Twenty20 international. East London - Proteas captain Faf du Plessis says New Zealand deserved to bounce back in the T20 series after Martin Guptill's unbeaten century drew the tourists level in East London. Guptill smashed 101 runs off 69 balls on Sunday as the Black Caps chased down their target of 169 on the Duckworth-Lewis method, with the match reduced to 19 overs a side after a brief power outage, to win off the last ball. The eight-wicket victory drew the New Zealanders square at 1-1, after South Africa coasted to victory in the series opener in Durban, with one match to play in Port Elizabeth on Wednesday. "I've always said that New Zealand has always been a great fighting team and we have never taken them lightly," Du Plessis said. "They have match winners in their team, which was the case with Martin Guptill tonight. He played a fantastic innings. "To score a hundred in a game like that, I think your team deserves it (the win)." South Africa's bowlers struggled in challenging coastal conditions, with spinners Robin Peterson and Aaron Phangiso going for more than nine runs an over. "I actually thought our seamers bowled really well but the ball was really wet so that made it tough for the spinners," the skipper said. "That is something I didn't anticipate, I didn't think the ball would skid on as much as it did for the coast. 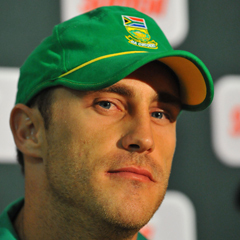 "The seamers, I thought, bowled well under pressure in the last four overs. Those were good conditions to bat in because the ball was skidding off the pitch." Earlier, Henry Davids, who made 55, scored a maiden T20 half-century, with Du Plessis contributing 63 off 43 balls as the hosts set a challenging target. "I was very happy with the batting," the skipper said. "The conditions weren't as good batting first, and it was a little bit slow so I thought 169 was a match-winning score. Obviously that wasn't the case."